More and more people in the world chose to become vegetarians, because it is proven that a vegetarian diet prevents cardiovascular diseases, and even the most serious illnesses such as cancer. This text does not deal with how to become a vegetarian in a short period of time, nor do we want this kind of diet imposed as the only correct one, each of us knows what is best for him or her. There are numerous written and published studies on this topic and we will stick to them. Brian Pobiner paleoanthropologist at the National Museum of Natural History, Smithsonian Institution, explains the major changes in the human diet during evolution. According to one theory, people began to eat meat because of extreme climate change, such as the Ice Age, which limited access to fruits and vegetables, essential for survival. 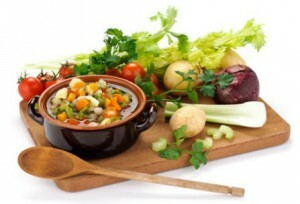 According to the author, today we plant foods that are very much available, vegetarian diet is quite a logical choice. Vegetarians are people who do not eat meat, even fish. Their vegetarian diet is based on the inter-seasonal fruits, vegetables, legumes, grains, seeds, healthy nuts, as well as milk, dairy products and eggs. People are opting for this diet for different reasons - personal taste, concern for their own health and the environment in which they live, compassion for animals, belief in non-violent life, numerous religious convictions and the like. If switching to a vegetarian diet is how nutritionists advise, you should gradually do it, slowly reducing the consumption of meat (first red, then poultry and eventually fish). A vegetarian diet is rich in valuable plant fibre, magnesium, vitamin B, C and E, iron and phytochemicals, the elements necessary for the health of our body. The Australian Institute of Health (Australian National Health) confirmed in 2013 that such a diet without meat may be beneficial for almost all ages, and observed a significant increase in its followers. A recent study from Sweden showed - in 2014, that every tenth resident of the Scandinavian countries is a vegetarian. It is considered that high cholesterol increases the risk of heart attack and other cardiovascular diseases. The Brazilian study published in the scientific journal "Arquivos Brasileiros de Cardiologia" in 2007 compared the levels of triglyceride and cholesterol levels in people whose diet included meat and those who have it completely removed from their diet. The results clearly showed that vegetarians have significantly lower levels of bad (LDL) cholesterol in the blood. "American Journal of Clinical Nutrition" also published back in 2009 confirms a lower risk of contracting cancer in people who do not eat meat. In support of this thesis, a year later, the University of Acheville (North Carolina) published an article in the December issue of the journal "Cancer management and Research" in which it stated its opinion that a vegetarian diet reduces the risk of cancer by as much as ten percent. Due to considerably lower intake of harmful fat in the body, as well as more vitamins, vegetarians are less likely to develop chronic diseases, and are in better mood than people who eat meat. A study in 2012 examined the emotional state of people who were on three different diets, the first of which allowed all kinds of meat, others were vegetarians who ate fish, and the third were only eating foods that were plant-based. Vegetarian diets that exclude meat proved to be the most effective in the sense that the participants were more willing and more satisfied. Does a vegetarian diet have shortcomings? Vitamin B12 is essential for protecting the health of nerve cells, the production of DNA and RNA genetic material, and maintaining the levels of red blood cells. A vegetarian diet that includes dairy products and eggs will allow you sufficient amounts of vitamin B12. But if the diet does not include any kind of animal products, it is necessary to supply the body using these vitamin supplements. Vitamin D helps the body absorb and use calcium, iron, magnesium, phosphate and zinc. There are a number of food products that are rich in it, such as domestic or cow milk and soy. Our body is also able to produce only a certain amounts of vitamin D, but only when the skin is exposed to sunlight. If the body lacks this vitamin, it is recommended, in the case of vitamin B12 to take additional supplements. Calcium helps in the development of bones and maintaining the health and quality of teeth. Dairy products are the best source of calcium. Also, dark vegetables, such as beets, spinach and broccoli, can provide the appropriate amounts of calcium, as well as sesame, homemade bread, dried figs, yogurt and chickpeas. Experts recommend 1,000 mg of calcium a day, which is equivalent to three cups of milk or yogurt. If your choice is a vegetarian diet, be sure to listen to this advice. Iron is an important constituent of red blood cells. Beans and peas, grains, lentils green leafy vegetables and dried fruits are excellent and valuable sources of this mineral. The human body is not able to quickly absorb iron from vegetables, and foods that contain it are combined with those that are rich in vitamin C, such as tomatoes, strawberries and green peppers. If you cook food in metal pots it also contribute to the introduction of iron in the body. Zinc is an essential component of many enzymes and plays an important role in cell division and protein formation. Like iron, it is not absorbed so easily when the body is supplying it from plant sources. Cheese is a good option if your vegetarian diet includes dairy products. Plant sources of zinc include certainly grains, soy products, legumes, nuts and healthy wheat germ. Preheat the oven to 200 degrees C. Clean 400 g of large mushrooms and remove their handles. Brush them on both sides with olive oil and sort them in a baking pan or baking dish lined with paper baking. Stir into a bowl 50 g of ricotta cheese, two to three chopped cherry tomatoes, olives 50 g and 100 g of Parmesan cheese. Add the oregano, parsley, one egg (optional). Then fill the mushrooms and bake for 15 to 20 minutes. Sprinkle with some fresh parsley leaves and serve with a green salad or toasted bread. Prepare the béchamel sauce from a cup of melted butter, a cup of flour, four cups of warm milk, two egg yolks and other spices to taste. Then chop rings of three eggplants and approximately 700 g of potatoes. Coat a baking sheet with butter and sort sliced ​​potatoes first then eggplant over it. Stack vegetables until you do not have any and then pour the béchamel sauce and sprinkle with Parmesan cheese. Bake in the oven until golden and then let it stand at least 40 minutes before serving. Wash and gently cook down small head of cabbage. Strain and set aside. To make a filling, take the pan in which you heat a little olive oil, then add the head of chopped onion and shredded clove of garlic. Simmer until tender and translucent. Add 500 g of chopped mushrooms, salt and pepper, and cook, stirring occasionally. Add one decilitre of local red wine to the mixture and mix until all the liquid has evaporated. Season with a little rosemary and thyme and remove from heat to cool. For the sauce: in a saucepan cook two cloves of finely chopped garlic and stir for about half a minute. Then pour a 0.5 litres of tomato juice, reduce the heat, add the wine and allow the sauce to unite before you remove it from heat. Slowly remove the cabbage leaves and stuff them. Ready-made vegetarian cabbage rolls put back in the sauce and let it simmer for about five minutes. Serve warm. We hope you got interested in vegetarian diet and we advise you if you are planning to migrate to it, to do it slowly and gradually, moderation in all things is the most important thing.